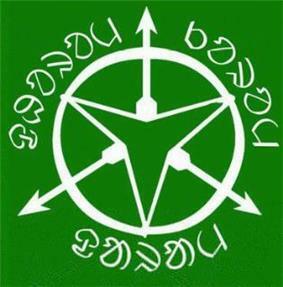 The flag representing the indigenous Sarna religion of the Adivasi of central-eastern India. Sarnaism or Sarna (local languages: Sarna Dhorom, meaning "Religion of the Holy Woods") defines the Donyi-Polo or Sanamahism. Sarna means "grove" and it is etymologically related to the name of the sal tree, sacred to the religion, from which is derived the other name Sari Dharam ("Religion of the Sal Tree"). Sarnaist followers have been organising protests and petitions to have their religion recognised by the government of India in census forms. In 2013 Sarnaist followers have organised a protest against use of indigenous imagery by Christians in order to attract converts. Adherents of Sarnaism believe in, worship and revere Dharmesh, or God as the creator of the universe, who is also called Dharmesh or Singbonga or by other names by different tribes. Adherents also believe in, worship and revere Chalapachho Devi, the Mother Goddess, identified as the earth, nature, and the World Tree, symbolised by the Sal tree. Dharmesh is believed to manifest in Sal trees. Sarna temples are called sthal or asthal, and can be found in villages, while worship can be performed also in jaher, or sacred groves. Sal trees are present both in the temples and the sacred grove. The ceremonies are performed by the whole village community at a public gathering with the active participation of village priests, pahan. The chief assistant of village priest is called Naike. Kishor Vidya Niketan. The Spectrum of Tribal Religion in Bihar: A Study of Continuity & Change Among the Oraon of Chotanagpur. 1988. Oraons & Sarna Religion. Articles On Jharkhand, Its Tribal People & Tribal Society. Koenraad Elst. The Sarna: a case study in natural religion. ^ Pranab Mukherjee. Tribals to rally for inclusion of Sarna religion in census. Times of India, 2013. ^ Kelly Kislaya. Tribals to remove Virgin Mary’s statue if attire isn’t changed. The Times of India, 2013. ^ Anumeha Yadav. Tribals torn apart by religion. The Hindu, 2014.